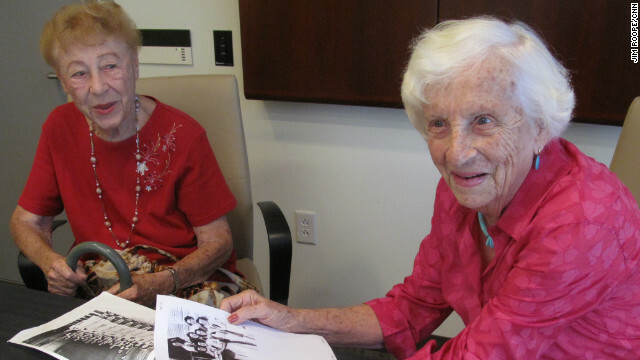 Florence Mast (left) and Doris Vick (right) reminisce about their WWII service in the Navy WAVES. (CNN) - 91-year-old Florence Mast and 89-year-old Doris Vick served in WWII's US Navy as 'Women Accepted for Volunteer Emergency Services,' also known as Navy WAVES. Vick joined the Navy at the age of 20 against her father’s wishes. Since her mother was an Army nurse in WWI though, her father was quickly convinced to give his permission. Much of Florence Mast's family was already serving when she decided to join. Her father was in the Navy, her brother joined shortly after Pearl Harbor, and her husband was in the Army serving overseas. When she signed up for the WAVES, Mast wrote her husband to tell him of her decision. She says his response was less than supportive. [2:11] “Don’t do it. Don’t do it or I’ll divorce you. That was the message. But I wrote to him saying it was too late, I was in the Navy. Both Florence and Doris went through boot camp at Hunter College in New York. The two spent the war working in state-side hospitals. Editor's Note: Here Florence and Doris' story in the SoundCloud player above. This conversation really made my day. My mother, who has been gone now for 15 years this month, was also a WAVE during WWII and was stationed in Key West. Though it was war time she had a very positive experience. She didn't tell her parents she had joined the Navy until the day she was leaving. They would have stopped her. She loved the marching that Florence talks about. Thank you for your service, Ladies! My mother served as a Navy WAVE supply clerk in San Francisco in WWII. She served with dignity and pride that she was able to answer the call to duty at a time her country needed her. Serving as a WAVE was a defining period of her life! Truly amazing women, and pioneers for the cause, allowing future generations like my mother to serve admirably. Thank you both, and God bless. No they served in actual and unavoidable wars so future generations would not have to and could go on to do things better with their lives. i.e. higher education. I swear with dopes like you there is no progress. My uncle ww2 vet and pow said himself that should have been the last war for the USA. there are no last wars. your uncle was wrong. Thank you ladies, Your service has made it so that myself and women can serve in the NAvy. Thank you Florence and Doris for your service and best wishes to two Real Ladies. I may have been born in the wrong era (1948). I would have loved serving with the two of you and women like you. I SALUTE and THANK YOU for your service. Because I people like you, I am FREE. My Aunt was a Navy nurse in WWII and called back in Korea. I really don't know too much about where she was, I just know she met my uncle who was a Marine in Korea. Both of them are gone now. It feel s great to know that my family has given so much for this country in the last three generations, that I personally know of. My Father, 4 uncles and an aunt were in WWII. My aunt, and two uncles in Korea. A couple of cousins were Vietnam Era and one during Desert storm. One uncle was killed in Europe. My father-in-law, myself, and my wife's uncle are Vietnam Era, and two of my daughters and two sons are Veterans of Iraq. These are the ones I can think of right off. Unfortunately I was born a generation too late (or two). My grandfather was a WWI vet. My dad was a WWII vet. I would have been honored to stand beside these women! I send many salutes to those Old Women Veterans. I am a Vietnam veteran and my heart goes out to Doris and Florence. Thank you ladies!! I admire your service to our country. I wish women like Doris and Florence could stay around forever! True patriots! Thank you for your service! I truly enjoyed the conversation with Doris and Florence. The courage of the women of WWII was absolutely on par with the men. It's understandable why some call them the greatest generation.